BC Kiribati informed members in December last year (2018) on the common activity for 2018 which is about the sharing of professional experiences to inspire members on the importance of maintaining connecting and networking. The video of BC Australia professional networking experience was also posted on the Bridge Club Kiribati facebook page for members to see. 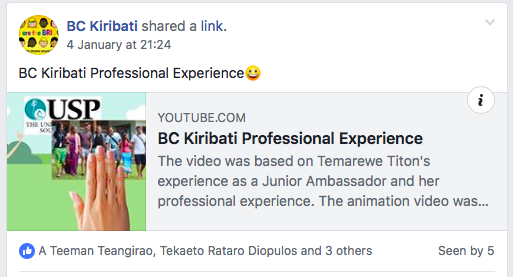 4 members have liked or reacted and 7 members have seen this post which means that this sharing has touched and inspired BC Kiribati members. This is reflected in the audio provided by a member of Bridge Club.